Some things just scream for a virtual experience – or at least a 360° video. And a VR flight in a body-controlled jet engine power suit is one of them.
. . . has invented, built and filed patents for a human propulsion technology that re-imagines manned flight. Our technology combines body mounted miniaturised jet-engines with a specially designed exo-skeleton allowing vertical take off and flight. Gravity Industries founder, the English inventor Richard Browning, comes across as an Iron Man from the future, flying around a suit that uses six miniature jet engines. So it made sense to share the experience through a VR camera setup. VRScout has an account of the event. 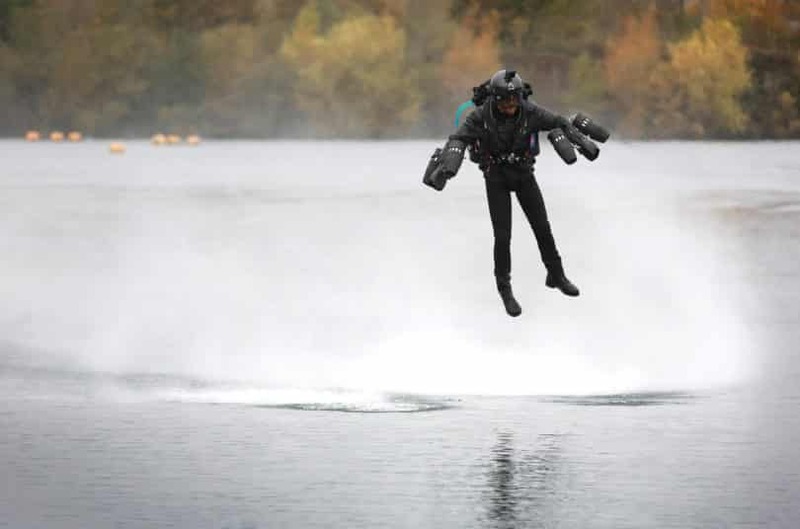 The 360-degree audio-visual experience was made in partnership with VR agency Visualise, which fitted a multi-directional camera and microphone to Browning, and filmed as he set the Guinness World Record for the fastest speed in a body-controlled jet engine-powered suit, achieving a top speed of 32.02 miles per hour, over a lake in Reading, United Kingdom.
. . . Browning said they’d had hundreds of request from fans and partners all over the world to capture a flight in 360 video, and they now plan to produce an entire series of VR experiences as part of a retail and brand partnership due to be launched in early 2018. Here’s the first 360° video in the series. 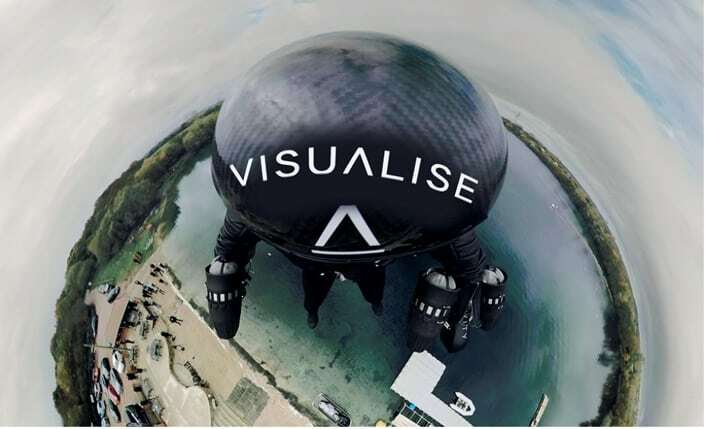 The VR studio behind the VR flight, Visualise, has produced over a 100 VR experiences and 360° videos in the last four years. You may know their work – they produced the Adidas by Stella McCartney / City x Nature project, the Sea Prayer: a 360° story inspired by refugee Alan Kurdi, and Dublin in the Dark: The Story of ‘Emerald Noir’ to name just a few. It’s a breathtakingly wide range of work in VR – from commercial to social issues, nature, and immersive storytelling. Summaries of many of their projects are available at Visualize – Work. Visualise has also done other VR flight experiences such as the Thomas Cook Virtual Reality Holiday, ‘Try Before You Fly’. Projects like this are already demonstrating the tremendous ROI potential for the use of Virtual Reality in the travel sector. Thomas Cook saw a 190% increase in NY excursion bookings after users tried the experience in VR. It’s worlds apart from the traditional glossy travel brochure approach. “The end result when viewed in a headset is an extraordinary experience and the closest thing to actually flying the suit. Of course, we’d love to see a VR experience like this for Oculus Rift or HTC Vive that utilized the hand-controllers and your body movements. For now, you’ll have to settle for Google Cardboard or other low-end VR headset. But settle we will (for now). It’s serious fun and a sign of some of the exciting VR developments to come in 2018. A breakthrough in lenses for VR and AR headsets?